Arthur does not know who his siblings are. Born in a harbor town of England, he was living alone by the time he realized what life was like. On that street, which was the key point of the Atlantic trade, even a beggar could make enough money to live a day. At the age of 8, by the suggestion of a sailor who became close to him, he became a sailor. Life on the sea as a handyman of the ship was fun. But, his travel as the mascot of the ship, being loved by the crew, was over only in 2 years. When they visited the country of the Far East-Japan, known as the island of gold-a wealthy merchant who was trading with them took him as a stepson. For the merchant, he only took Arthur in as a collection of things from the West, but a 10 year old boy couldn't have understood such peculiarity of an adult. He was very happy to have someone to call father. He learned Japanese and the Japanese manners so as to please his stepfather. The Japanese people disliked and criticized "the foreign boy who acts like a Japanese' and eventually, his stepfather offered him to a noble in the excuse that it was to teach him manners. In the battlefield, his appearance was a target. Arrows, blades and lead bullets attack him. To stay alive, he had no other way but to fight recklessly. And one day, after countless battles gave him confidence about his skills, he realized. What he is is neither a Japanese, nor a foreigner, but a swordsman without roots. The Japanese just look at him with curiosity, not as a man. But there's no way he could be European again, having forgotten his mother tongue already. An ineffable anxiety overwhelmed him. What to do to be recognized as a man-the only way was to fight. Achieve what no one else can by accomplishing brilliant exploits! Without knowing what to accomplish, he left his home and wandered the battlefields. To become stronger, he risked his life many times. As a result, he lost an eye that people said was like a jewel and what he gained were countless scars, self confidence that he can't lose to anyone, and a lovely woman who used to be a prostitute, who followed him like a shadow. By the time a baby of mixed bloodline was born, a rumor reached his ear. The evil knight of the West. And Soul edge. It was like an oracle to him, who didn't know what to accomplish. If he defeats that knight and obtains that sword that's called invincible, this time, people might recognize his skills. Then his love and his baby won't be seen as strangers. Leaving behind the woman and the suckling, he went aboard a ship again after 20 years. At the moment a cannon signaled the departure of the ship, the long-forgotten scenery of his homeland came back to him like an illusion. Arthur began his search of Nightmare, but he cannot find his whereabouts, and eventually he realized his own weakness. He was just a man, and finally understood that this search wasn't worth his consideration, and taught what he should do next. He found, as proof of his journey, a piece of Soul Edge and took it with him. He returned to his lover and engaged in matrimony. He then returned to the battlefield to support her and his daughter, but a bad feeling was always in his hearth. 2 years after his wedding, an epidemy attacked his town, but thankfully Arthur's family wasn't affected by it. The wife carried the fragment he gave her always, and when the epidemy faded and the town began to restore itself, Arthur's wife fell ill.
Then one day Arthur returned home only to find his daughter crying over his wife, who was in the floor. As he approaches her skin began changing color. A doctor treated her, but nothing could be done and she died. Arthur was stricken with grief, when a small man appeared. He probably was just a traveling doctor who heard about her strange illness, but Arthur let his emotions cloud his mind and expelled him shouting. The man left, saying it was the fault of "that piece of metal". Arthur was amazed after hearing his strange language, but he couldn't find him anywhere. After the funeral of his wife, Arthur recalled that man's words. He felt that his wife's death was his fault for giving her that fragment. So he decided what to do: destroy Soul Edge, that was the only way he found to stop the sadness in his hearth. The next day he embarked with his daughter again into the exotic lands, this time seeing at the distant as if he could see the wicked sword itself. 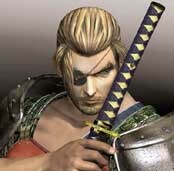 I find it interesting that by giving Mitsurugi an eye patch and blonde hair, he is "no longer a samurai"... lol. 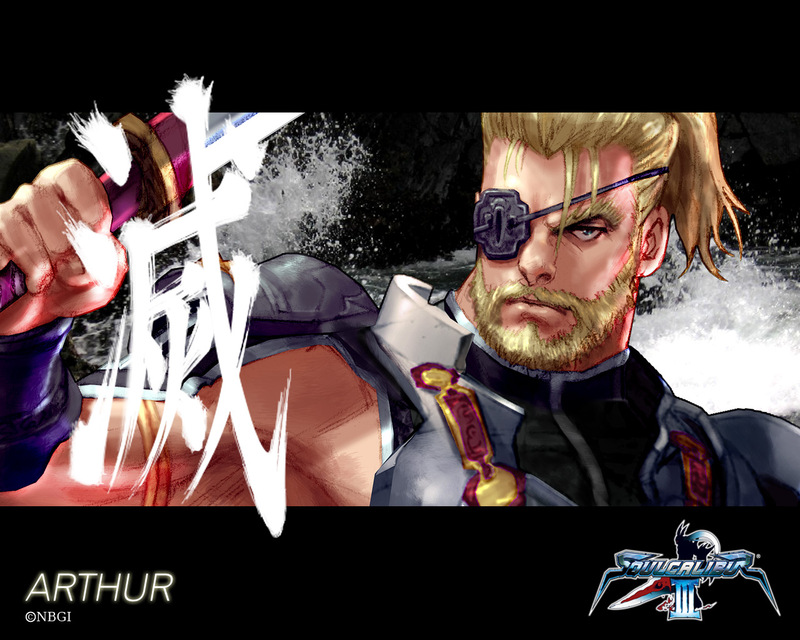 I was confused by this design when I first saw him at the arcade in SC, and perhaps for that reason, I thought Arthur was pretty cool for a random palette swap. 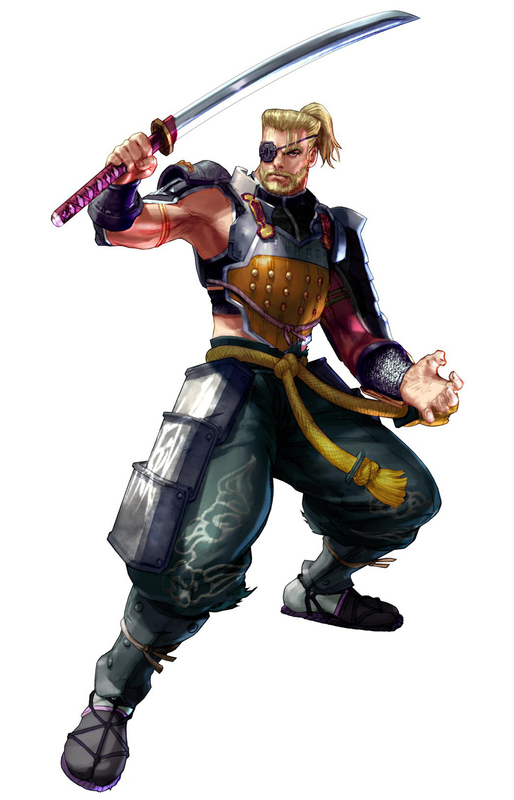 Namco tried to bring about some fan service and actually reinvented him in Soul Calibur 3. As a "bonus character," Arthur was alright. 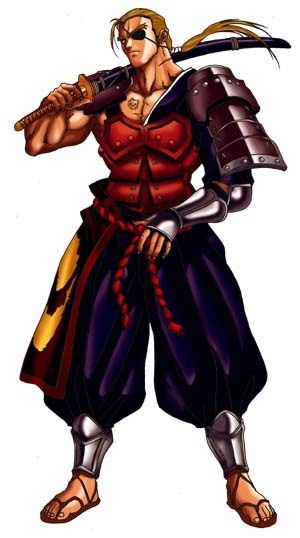 At first glance, I thought it was cool that he wore Mitsurugi's original SC2 outfit (since Mitsurugi's new SC3 costume was a lot different). 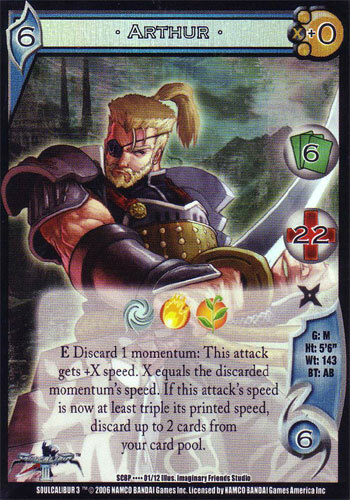 Anyhow, his SC3 moveset was average at best... Arthur actually has quite a few sloppy and silly moves in SC3... It would've been better if he had more of Mitsurugi's original SC2 moves, actually.